The African Magic gaming machine contains 5 reels and 25 lines for collecting prize combinations. Before the start of the game you have the right to activate any number of pay lines, however the maximum number of lines ensures greater success in the game. Then you need to determine the number of game coins per line and make a bet. You have the opportunity to put on 1 active gaming line from 1 to 10 coins. The user chooses the face value of the coin from the offered variants from 0.01 to 0.10 euros. The African Magic gaming machine also has the option of doubling the winning amount received by the user during the successful rotation of the reels. The mini-round is presented in two variants, which contain a different percentage of the risk. You can try to guess the color of a closed playing card, which, as you know, can be black or red. And you can complicate your task by trying to guess the suit of the playing card. The win is able to multiply your prize amount, obtained during a successful spin, by 4. 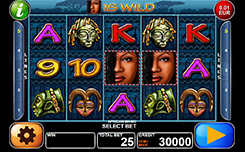 The African Magic slot machine is characterized by an exciting gameplay, during which the user can earn generous prizes.